From The Caprilli Papers: “Consistency of position throughout changes of balance” – The pianoforte – at Tor di Quinto Cavalry School. The Horseman’s Dictionary; by Lida Fleitmann Bloodgood and Piero Santini. London: Pelham Books, 1963. Out of print. The Caprilli Papers: Principles of Outdoor Equitation; by Captain Federico Caprilli. Trans. and ed. by Major Piero Santini. London: J.A. Allen, 1967. Out of print. At the turn of the last century, the Italian cavalry officer Captain Federico Caprilli (1868-1907) developed a radically new system for riding across country and jumping fences — a system originally known as the Italian School or Method and later, and more commonly, as the “forward seat.” It spurred a revolution in both military and civilian equitation. Though Caprilli died prematurely at age 40 and left precious little writing on “Il sistema” behind him, he had trained many brilliant students who carried its principles forward. Major Piero Santini (1881-1960), Caprilli’s most ardent disciple and a tireless advocate for his system in the English-speaking world, published an influential trilogy of books advancing the principles of forward riding: Riding Reflections (1932), The Forward Impulse (1936), and Learning to Ride (1942). Santini also played important roles in two posthumously published books: The Horseman’s Dictionary (1963) and The Caprilli Papers (1967). Having published three essays on Santini’s trilogy on Horsetalk.co.nz, I would like to round out the series with a comment on his posthumous works. Lida Fleitmann Bloodgood, a distinguished equestrian and author and Santini’s “lifelong friend and collaborator,” joined him in compiling The Horseman’s Dictionary. Its dust wrapper describes it as “a dictionary, not an encyclopedia. It confines itself to the precise meaning, or variety of meanings, of equine terms.” It offers brief definitions, in short, not long explanations, and it contains, by my count, some 3000 separate entries. While many of these entries simply cross-reference terms, many others, with sub-entries, define multiple terms (the entry on Pelham bit, for example, defines 16 types, and that on Hunting jumps 35 types). Though dictionaries, as reference works, mean to be consulted, not read, dictionaries in special fields often reward reading. The Horseman’s Dictionary is one of them. First, the definitions are accurate, informed, and concise, and a large majority of the words defined are still in use; they augment and sharpen a reader’s working equestrian vocabulary. Second, the words no longer in use, many pertaining to carriages and other conveyances for the Road, open windows onto the past; they enhance a reader’s knowledge of equestrian history. And third, most amateur equestrians practice one discipline, and may have little knowledge of others; this book broadens a reader’s disciplinary perspective. “Calling a cab”, defined by Bloodgood and Santini as a “once common but now fortunately almost obsolete habit”. A very different kind of book in both form and content, The Caprilli Papers is a large but slim 8vo — an elegant piece of bookmaking comprising only 40 pages of text plus 26 pages of photographs. The text derives its importance from the rarity of its contents: Caprilli’s words. Like “his spiritual ancestor Pignatelli,” Santini had written in The Forward Impulse, “Caprilli had an antipathy to writing only second to his dislike for walking.” As a result of that antipathy and a short life, as noted above, Caprilli published very little writing — astonishingly little, given his eventual reputation as Grisone’s peer in genius and influence. Santini notes in his Introduction that “in the compilation of the ‘Papers’ I have drawn on three sources, namely two published pieces by Caprilli together with “the Notes which were to serve for a treatise on his system.” The “papers” comprise substantial passages from Caprilli occasionally interleaved with explanative (or interpretative) glosses, often acerbic, from Santini. Put differently, here as in other works, Santini stands as Caprilli’s “intermediary and interpreter” (to use Hope’s terms). If this has allowed generations of horsemen to hear Caprilli, it has also required them, in effect, to hear Caprilli through the medium of Santini. Captain Caprilli demonstrating the forward seat. 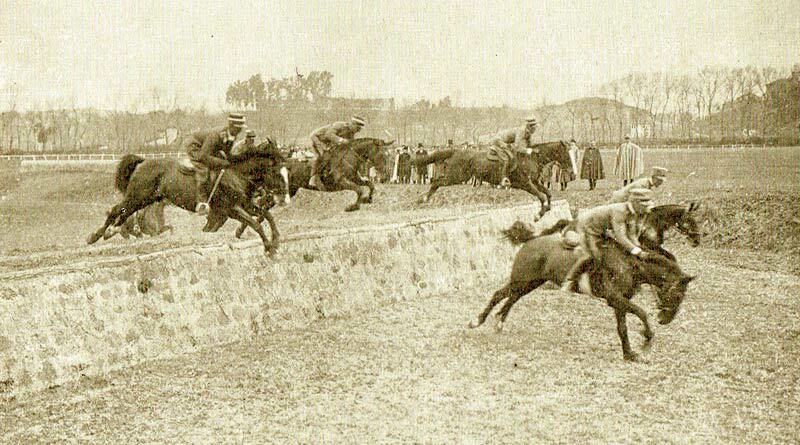 An instructor of officers and of officers as instructors, Caprilli contends that forward riding is the only correct method, because “any other method is harmful and teaches artificial action, in direct opposition to the horse’s natural mechanics.” An important corollary is that “jumping is not an end unto itself but a means by which to apply practically the fundamental principles of our method.” As Caprilli later explains, “when the rider is capable, throughout the entire course of a jump, of smoothly conforming to the movement of his horse, he will have developed more than sufficient dexterity not to disturb him in anything else he may do.” Forward riding, in short, enables correct jumping, and correct jumping improves forward riding. In addition to the frontispiece — a handsome photographic portrait of Caprilli on “Pouff” — The Caprilli Papers includes “40 illustrations from old and rare photographs collected by Major Santini,” to cite the title page. They command as much attention as does the text. Not simply “illustrative,” they in fact constitute a coherent, edifying, and engaging visual narrative that documents three periods in the development of the Italian forward seat: Pre-Caprilli Period (13 photographs), Transition Period (also 13), and Post-Caprilli Period: The Italian seat in its hey-day (14 photographs). Long out of print, The Horseman’s Dictionary and The Caprilli Papers are currently available in neither reprint nor print-on-demand formats. Scarce copies can be found on the specialty book market, however, with the former title, generally the worse for wear, in the $15-25 range, and the latter title, when well preserved, in the $150-250 range. They are worth searching out. The slide at Tor di Quinto. ← What are giant crystals doing within the cartilage cells of horses?